This is not a pleasurable read. This is not an unpleasurable read. This is a mind-dissolving read. The absurd coincidence of the Germans’ V-2 rocket bombings locations during World War II and Tyrone Slothrop’s mapping of sexual scores is merely the tip of the iceberg of the monumental illogicality that is this book, among a gazillion other things. This monster novel is as unreasonable and stylistically elaborate as it is intelligent and, interestingly enough, carefully structured, and Thomas Pynchon is THE guide to that terrifying writers’ world where the line between reality and fantasy is a blur. Gravity’s Rainbow is an overwhelming achievement of conceptual fiction full of researched symbolism and metaphor, full of global historical, cultural, literary, philosophical and behavioural references and full of linguistic risks (that pay off). Yes, of course abstract postmodernism is the known excuse of the elitist (see “I’ll write something incomprehensible and nobody will dare to say it’s rubbish; not if I call it avant-garde” mentality), but that shouldn't drag the real thing down. For me, Gravity’s Rainbow doesn't actually score a Ulysses ten-out-of-ten, because some of its references and themed concepts felt better approached than others; noticeably better. Corporate conspiracy, the penile nature of rocket science and Pynchon’s existentialist explorations were fantastic, but I’m not sold on those make-love-not-war passages, because I didn't believe them. 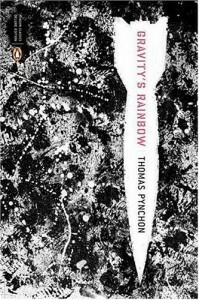 On the other hand, Gravity’s Rainbow is so effortless, it makes a good book like Infinite Jest look accessible and desperate for polarity. As talented as David Foster Wallace was (a lot), Infinite Jest reeks of a “love me or hate me, but please don’t just like me” attitude, which actually helped me decide upon the 3 stars that I rated it with. Infinite Jest is a good book, but it isn't the real thing because the author’s talent is at odds with the book’s pretentious atmosphere. And this is why I only liked it. With Gravity’s Rainbow none of that feels significant, because it is the real thing. Definitely not for the impatient, but isn't this at the core of making sense out of reading anyway?